“The White Car” contemporary figurative painting. acrylic on canvas. 30 in x 40 in. 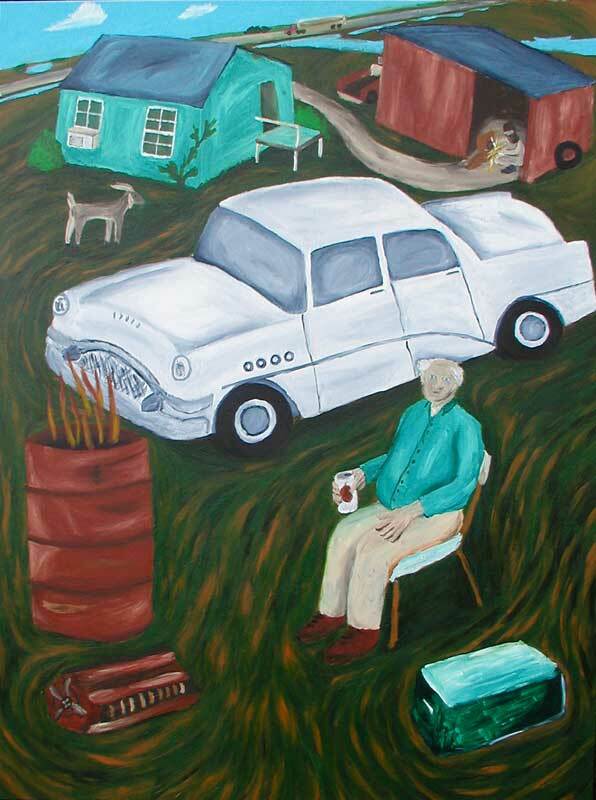 “The White Car” is a painting about growing up in the Mississippi Delta. We lived out on highway 82 going out from Greenville toward the river bridge. All the houses scattered around us were relatives, all members of my father’s extended family: great uncles, uncles, cousins, etc. Our house was between my grandfather’s house and the highway. He lived by himself in an older house that had originally been an overseer’s house. Behind his house was the main welding shed, and a field full of old tractors and broken-down trucks. All this old equipment was rusting and surrounded by Johnson grass as tall as a full grown man. My grandfather kept goats to help keep the weeds down, but mainly they stayed under the pecan trees down in the pasture. Sometimes I would be sent into the field of rusting trucks with a handful of wrenches to retrieve an alternator, radiator, etc. All my father’s people were silent people, mostly men. They spent every afternoon and evening gathered around the welding shop drinking beer and working on whatever happened to be broken: tractors, washing machines, cars, whatever. My grandfather would be there to, but he had been there all day because he was retired. He spent all day sitting there at a home-made table under the awning of the shed. He stared out at the levee and burned trash in an old 55-gallon drum. Beside the shed was a white 1955 Buick. It was kept in good condition but never driven anywhere. It was always there between the house and the shed. When the tires would dry rot and go flat over the years, they would be replaced. Every few months, the car would be moved so that the grass around it could be mowed. No one ever spoke about the car or even mentioned it, even though it was sitting right there. I think this was because my grandmother had been killed in the car when my father was in the navy. I don’t remember who told me this, but I’m sure it was my mother because I can’t imagine my father or grandfather ever talking about it. The car was restored some time after the accident but before I was born. I’m sure that my grandfather or my father or one of my uncles did the restoration work themselves. Momma would send me over to the shed to get him for supper most days. On Christmas and Thanksgiving it would be the same. He would come over and eat, and after dinner was over, he would walk back to the shed and sit back down or go back to his house and go to bed.